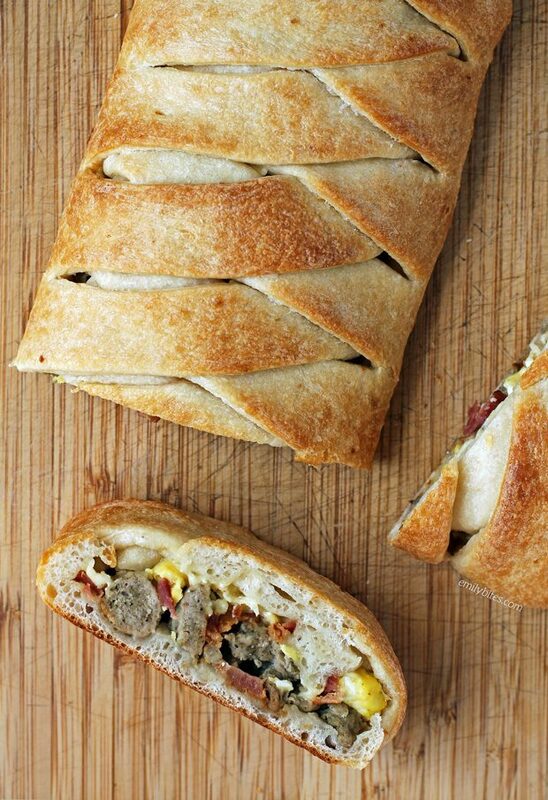 This Bacon Sausage Egg and Cheese Braid may look like a fancy, complicated breakfast but it’s so easy to make! If you can make bacon and scrambled eggs, you can make a breakfast braid. This braid is an impressive main dish for a holiday brunch or family breakfast and pairs perfectly with a fruit salad. Plus, with bacon, sausage, eggs and cheese braided into pizza dough, there’s something for everyone. Still need convincing? Each thick, hearty slice is packed full of flavor for only 212 calories or 5 Weight Watchers Freestyle SmartPoints! 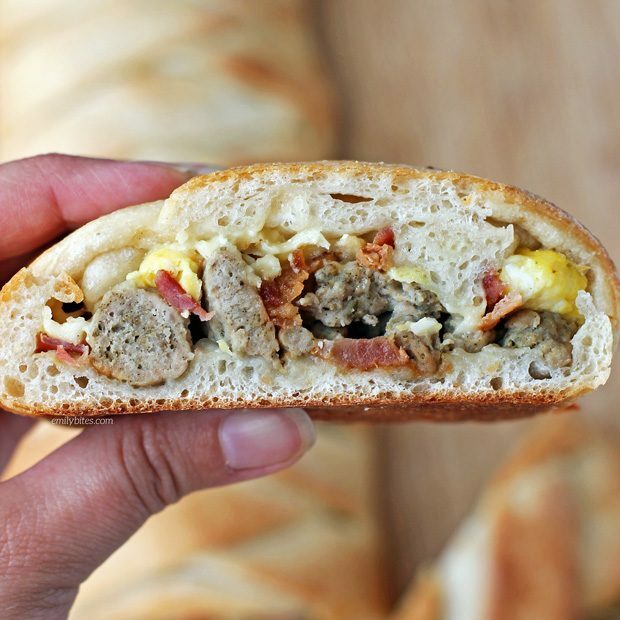 Put this Bacon Sausage Egg and Cheese Braid on your meal plan for this week and you won’t be sorry. Looking for more tasty, lightened up breakfast recipes? Check out my Apple Streusel French Toast Muffins, Ham and Cheese Hash Brown Quiche, Maple Bacon Breakfast Wraps, Pear Gingerbread Baked Oatmeal Singles, Bubble Up Breakfast Casserole, Strawberry Banana Baked Oatmeal Singles, Hummus and Feta Omelet, Mini Dutch Baby Pancakes, Sausage Egg and Cheese Hash Brown Cups and many more in the breakfast category of my recipe index! Cook the bacon according to package directions and set aside on paper towels to drain. Crumble or chop the bacon when drained. In a mixing bowl, combine the ground turkey with the salt, black pepper, sage, thyme, marjoram and crushed red pepper. Stir (or mush with your hands or a fork) until the turkey is well combined with the seasonings. While the turkey is cooking, break the eggs into a mixing bowl and beat together. Add a splash of water and stir to combine. When the turkey is done, mist the skillet with cooking spray and bring over med-low heat. Add the eggs and cook, using a spatula to move the eggs around, scrapping the thin layer of cooked eggs off the bottom until all the eggs are cooked and fluffy. Set aside. Unroll the pizza dough onto a piece of parchment paper and roll the dough to be 10”x14.” Using a pizza cutter or a sharp knife, make cuts up one of the longer sides of the dough, about 1 inch apart and about 3 inches long (into the center). Mirror those cuts on the opposite long side of the dough. Spread the turkey mixture down the center of the pizza dough, in a row with the cuts on either side. Top the turkey sausage with the scrambled eggs, chopped bacon and shredded cheddar. Starting at one end, fold a strip of the sliced dough on the side diagonally over the center ingredients. Fold the strip across from it over that strip in a criss-cross and repeat, alternating sides, until the strips of dough are covering the center in a braided pattern. Brush the top of the braid with the melted butter. Transfer the parchment paper with the braid onto a baking sheet and bake in the oven for 20-25 minutes until the dough is golden. Slice into 8 equal pieces and serve. 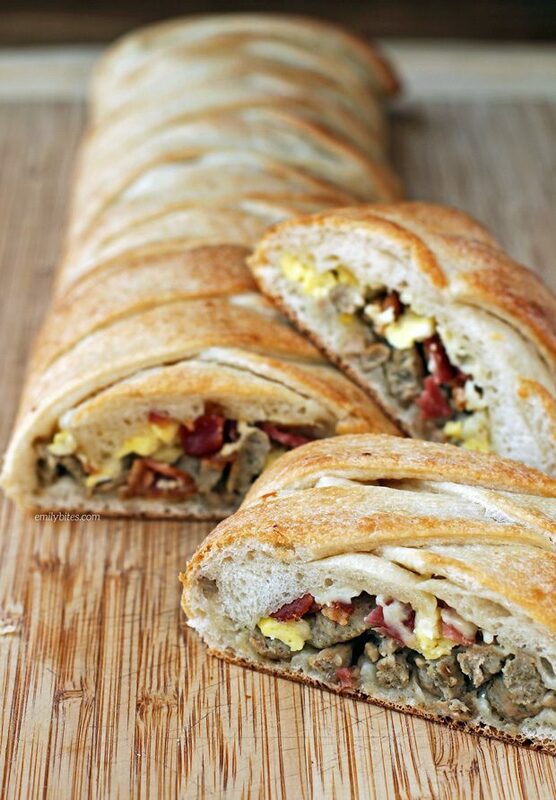 Bacon Sausage Egg and Cheese Braid is Delicious Food . How many points are these meals?? did you use sausage or ground turkey? This seems like it would make such a fun breakfast food. It would be extremely easy to eat and take on the go too. Can you freeze this after it’s made?